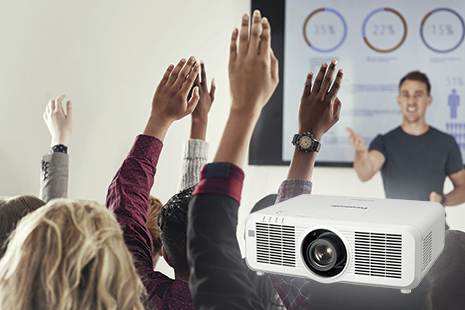 Building on the success of the PT-RZ970 10,000 lumen SOLID SHINE projector, Panasonic has launched a new 1-Chip DLPTM laser projector, which sits within the existing housing of the 7,000 lumens PT-RZ770 series. The PT-RZ870 projector blends crisp and vivid imaging with bright, dual-laser-module and dual-phosphor-wheel SOLID SHINE Laser drives. It is capable of maintenance-free operation for up to 20,000 hours thanks to air-tight and dust-resistant optical units and cooling systems negating the need for air filters. The PT-RZ870 is geared towards pro installations with 3G-SDI joining HDMI®, DVI-D, 5BNC, D-Sub, and RS232C connections as well as DIGITAL LINK compatibility. Designed to integrate into existing control systems, it is compatible with HDBaseT™, Art-Net, Crestron Connect™, and PJLink™ protocols; and share Panasonic’s family of interchangeable lenses for 1-Chip DLP™ models. The RZ870 is available from July 2018.